The trouble with boats is they occupy a tremendous amount of space when out of the water. Beale Park was full of boats that fold up, inflate or come apart to fit into the back of a car or on the deck of a yacht. There were two boats that split in the middle into two halves that can be nested for storage. First is the delightful Fairey Pixie, built on the Hamble in the early 1950s, when they sold for £23 10s - which was rather a lot. The cold moulded hull is a thing of beauty, the diagonal agba veneers glowing bright. 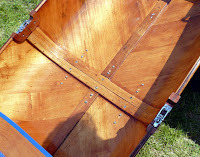 The two halves are held together by overcentre catches, water being kept out by a tongue and groove arrangement. 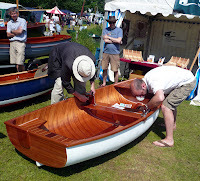 The boat is 7ft 8in long, beam is 2ft 9in and it weighs just 32lb. 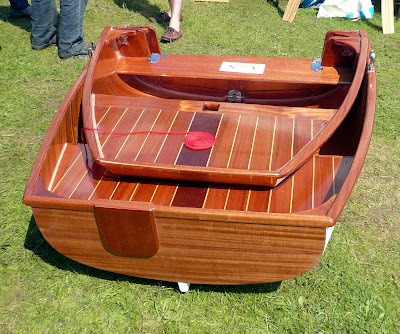 It can be fitted out for rowing. 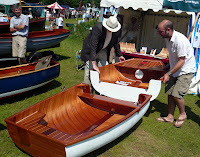 Ian Thomson of Nestaway Boats in Devon was showing his lovely nestable dinghy, also cold moulded, on the Lyme Regis Boatbuilding Academy tent. Rather than rely on the join between the halves remaining watertight, the Nestaway has a bulwark at the end of each half extending to above the waterline. A pair of pins and three bolts hold the two halves together securely, and it is easy to assemble on your own (though much quicker with two pairs of hands). 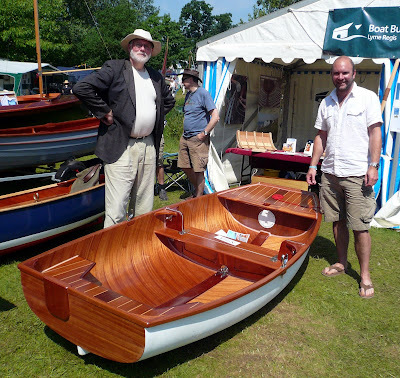 Ian designed the boat to fit on the deck of his sailing boat, and points out that it will fit in a largish estate car and stands upright in the back of a garage occupying very little room at all. I would be perfectly happy having it in the corner of my living room - it is much nicer than most of my furniture. 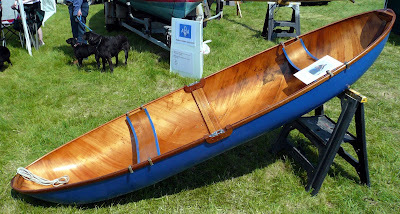 The result is a boat that should be a pleasure to row or sail, especially compared with an inflatable.